I hope this month starts out warmer! Joanie, this makes my heart smile! 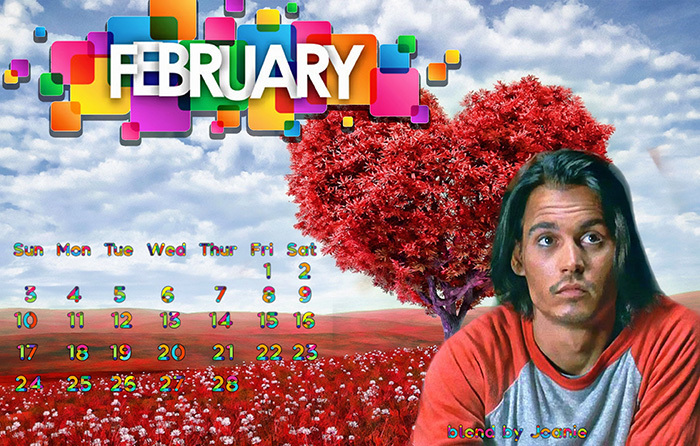 Thanks tons for the February calendar! Sorry there is no Valentine's day pic. I just can't find any new pictures to use and I'm sure everyone is getting tired of the same pictures over and over again. We're never tired of the photos you find that we can use! The way you present them is what brings the fun to the photo!! I know it has to be frustrating to be limited in what you can use, you're such an artist in your work! I'm sorry that we're limited. It really makes it hard for you! You've never put together anything that I was disappointed with or tired of seeing. Everything you do is a fresh interpretation of the photo! Hope that all is well with YOU!! Thanks Joanie!! Thanks, Karen. I'm still busy with my mom every day. I think you are such a blessing to your Mom and your family! You're a good daughter Joanie!! Y'all are always in my prayers.